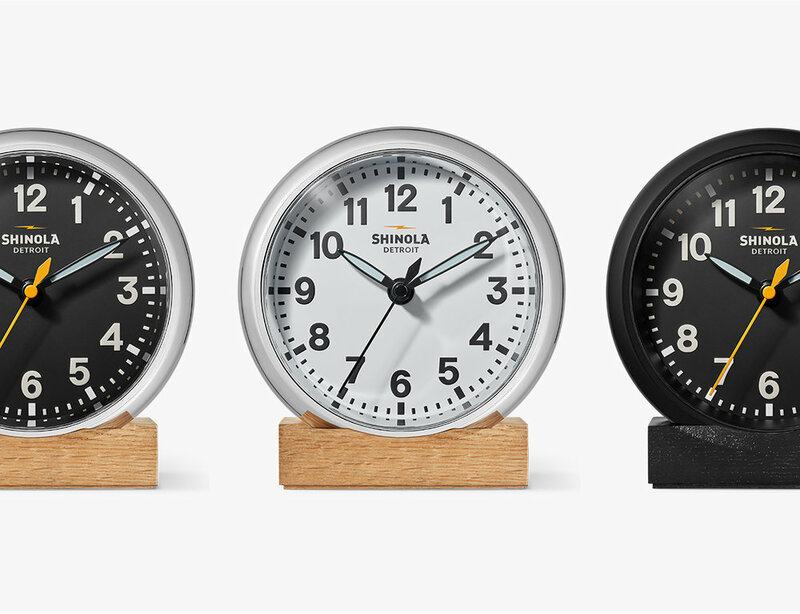 As a follow up to the Holiday 2016 release of the Runwell Wall Clock, Shinola has launched the Runwell Desk Clock. It’s always been my goal to create products / product systems that are simple so they can work across multiple colorways and sizes. That said, I loved seeing both the Runwell Wall Clock and wood stand simply reduced in size without any adjustment to proportion. I can’t wait to gift the set this holiday season. The Nuptse tape jackets have been updated with red to celebrate the city of Manchester. Have a look at the images below. For Bread & Butter Berlin 2018, The North Face teamed up with Berlin based design collective Tape Over to create 66 limited edition Nuptse jackets. I created 11 unique designs inspired by fireman’s jackets. The simplicity of each design allowed for quick duplication and consistency across handmade garments. Check out the images below and read more at Hypebeast and Complex. Astro Studios Included on Fast Company's "The World's Most Innovative Companies" 2018 list. Fast Company has released their list of "The World's Most Innovative Companies" for 2018. For the Design Sector, Astro Studios was ranked 6th "For ensuring that Shinola's new audio products support its made-in-America vision." I'm so thankful to have had the opportunity to contribute to Astro's long history of industrial design excellence and be honored along side giants like Wolff Olins, Audi, Ikea, and Monotype. Founded in 1994 by Brett Lovelady, Astro Studios is a 30-person design firm responsible for many of the world’s most recognizable tech products, including the Nike Fuelband and Microsoft’s Xbox 360. Recent work includes the Mira Prism, an AR headset that, unlike competitors, doesn’t block the user’s full field of vision, and the LINK AKC, a GPS-enabled dog collar and the first social platform for pet owners. Astro also lends its expertise in consumer electronics to less conventional tech companies. One of the studio’s longtime clients is Shinola, a lifestyle brand that specializes in American-made goods, like watches and leather items. Recently, Astro led the product design and line plans for a Shinola-branded turntable, clock, and power strip—the company’s first foray into consumer electronics. Astro also helped Shinola source materials and connect to factories and developers across the United States. The studio has worked with manufacturing partners in states including New Jersey, California, Montana, Michigan, and more, showing that CE products can be made in the United States. Astro Studios had a gaming arm, Astro Gaming, which sold to Logitech in 2017. During a typical image search session, I ran across these beautiful images of The Runwell Turntable by Peter Bellinger. I've never met Peter, but was so impressed with how he captured the product. When designing the turntable, I was obsessed with bringing order, simplicity, and warmth to a technical instrument that can often feel intimidating and cold. Peter's images effortlessly captured this approach and spirit. I really appreciate the time he took to understand the product while creating his art. Shinola restocks The Runwell Wall Clock and adds a Pine Green colorway. After launching last November, Shinola has added a new Runwell Wall Clock to the mix for Holiday 2017. This colorway features a matte cream dial with raised numerals and a gloss powder coated Pine Green case. Pick up a Pine Green Runwell Clock here, and check out the images below. Shinola launches the Canfield Headphone Collection. Shinola has announced the Canfield Headphone Collection including Over Ear and On Ear models. At Astro Studios we helped Shinola understand their position within the crowed audio market and realized how their warm, American inspired aesthetic would look in the form of a headphone. The Canfield Headphone Collection builds on design langue and positioning already established last holiday with The Runwell Turntable. Today's release comes with the announcement of The Canfield Earbud Collection which will launch in mid December. For now, you can check out the Canfield Headphone Collection below, and see both the Headphone Collection and Earbud Collection preview included in the links below. MINUS 8 Diver Rubber Straps. After the successful launch of the MINUS 8 Diver for Fall of 2016, I designed a Rubber Dive Strap that has released this week. Black, washed olive, and washed tan gradually introduced color to a brand that had been dominated by black, silver, and gold. Find a few images from the design process below. Shinola Adds Forrest Green to the Power Collection. Last November, Shinola x GE launched the Power Collection designed at Astro Studios. This November, the Power Collection is extended with a forrest green colorway of both the 2 Port + USB and 5 Port + USB models. Pick them up here and here. I had been thinking about the , AND WILLING premium dental collection for a few years now. The project started at and was supported by Astro Studios, so I felt I owed it to them and myself to bring this project to a close. Creating appearance models forced me to finalize all outstanding details across the product line and really think about material application. As always, there are a few things I'd change, but it was a great learning experience to take this self-initiated project to this level of completion. Below are some of the first shots of the models as I unboxed them earlier today. "Official shots" coming soon. The final product renderings and story can be found here.